Ryder Addicted To Pain Killers? In a three-year period Winona Ryder filled 37 prescriptions from 20 doctors under a half-dozen aliases, according to a probation report that concluded the actress is apparently addicted to pain killers. The report was released Friday after Ryder received a probationary sentence for stealing and vandalizing merchandise at a Saks Fifth Avenue store in December 2001. It paints a picture of the actress "doctor shopping" to obtain prescription medicines. Ryder was not convicted of any drug charges and defense attorney Mark Geragos emphasized she had prescriptions for eight medications found on her when she was arrested. Geragos, who tried to keep the report sealed, told the judge Ryder has a "pain-management" problem. The probation report suggests a different scenario. "While the defendant may have had reason in the past that necessitated her use of opiate pain killers, it would appear to the undersigned, as well as others, that the defendant is addicted to pain medication ...," said the report by chief probation officer Richard Shumsky and two deputies. Much of the report focused on one doctor who came under investigation for allegedly over-prescribing to his patients the week before Ryder's arrest. The report did not state the doctor's full name. The report said a week after Ryder's arrest police were contacted by California Medical Board investigator Charlene McKenzie, who told them that on Dec. 4, 2001, her office executed search warrants at the doctor's home and office. The search revealed Ryder was a patient of the doctor "under an AKA of Emily Thompson" and all the personal information in the "Thompson" file was Ryder's, including a photocopy of her driver's license and an original patient form signed Winona Ryder, the report said. Evidence indicated the doctor wrote prescriptions for her under both names, it said. "If the defendant was under 'pain-management guidance' then the procedures that are recognized to affect pain were certainly not followed by this doctor," the report said. "Apparently he was a popular doctor because he made 'house calls and hotel calls,"' the report said. It also noted Ryder filled many prescriptions at pharmacies in Hollywood and the San Fernando Valley. "The defendant had apparently used half a dozen names, some similar and some derivations of her own in order to get these prescriptions. Apparently she was 'shopping doctors' ... ," the report said. The report said Beverly Hills police detectives learned from federal drug agents and the state Medical Board that the doctor "had been kicked out of South Africa for 'overmedicating' people. He came to California and apparently is listed as a tattoo and hair removal doctor but at one time was a licensed internist." The document added, "Apparently, he is the doctor to many celebrity-type people." The authors of the probation report quoted police Det. George Elwell as concluding Ryder has a drug problem and needs intervention. "He claimed, 'We don't want to find her slumped over in a car with a needle in her arm,"' the report said. Ryder was sentenced to probation and community service Friday by a judge who warned her, "If you steal again, you will go to jail." Suprior Court Judge Elden Fox ordered the star of "Girl, Interrupted" and "Reality Bites" to pay $10,000 in fines and restitution and perform 480 hours of community service. Ryder, 31, made no statement to the court other than to acknowledge the judge's warning. She was also ordered to participate in a court-approved drug and psychological counseling program. Ryder had faced up to three years in prison, but prosecutors did not recommend any time behind bars because she had no prior convictions. "It is not my intention to make an example of you," Fox told Ryder. But he said she had disappointed many people and she would have to "confront certain issues" that led to her behavior. "You have refused to accept personal responsibility," he told the actress. "If you steal again, you will go to jail. Understand that?" he told her. "Yes, Your Honor, I do," she replied. As CBS News' Donna Tetreault reports, Winona remained relatively emotionless during the sentencing until fireworks began between the lawyers in the courtroom. Her defense lawyer, Mark Geragos, suggested that Ryder has been punished more than the average person would be because of the public attack on her character. "I don't think that one crime should trump all the good she's done in her life," Geragos said, citing Ryder's work with American Indian causes and with the Polly Klaas Foundation for missing children. At one point, prosecutor Ann Rundle began an angry speech concerning numerous references to the Klaas Foundation. Mark Klaas has supported Ryder, who donated a reward after his 12-year-old daughter was kidnapped from home and slain in 1993. "What's offensive to me is to trot out the body of a dead child," the prosecutor began. "I've heard this for over a year." Geragos objected loudly and Ryder rose partly from her seat, glaring. The judge admonished Rundle to stick to the shoplifting case. Outside court, Klaas said he was outraged by the reference to his daughter and credited Ryder with an unsolicited act of benevolence. 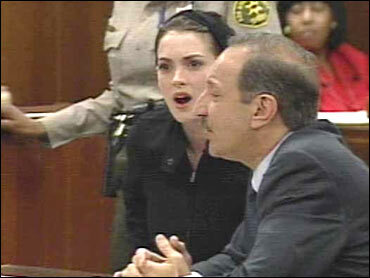 "Winona Ryder may be a double-felon, but she's a double-felon with a heart," he said. The two-time Academy Award nominee was convicted last month of felony grand theft and vandalism for taking more than $5,500 worth of merchandise at the Beverly Hills store a year ago. Deputy District Attorney Ann Rundle said at the time of the conviction that she would not seek a prison sentence. She did, however, call for a fine of more than $20,000.